1 cup finely chopped vegetables - broccoli, cauliflower, carrots, tomatoes, mushrooms, onions, radishes etc. Preheat oven according to crescent roll directions. 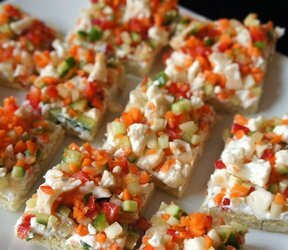 Spread rolls on large baking stone or rectangular baking pan. Pinch or roll together. Bake according to pkg. directions. Let cool. Mix together mayonnaise, cream cheese, sour cream, and dressing mix. 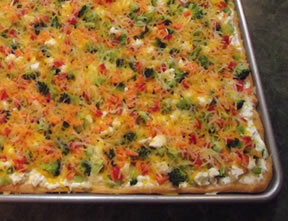 Spread on cooled crust. 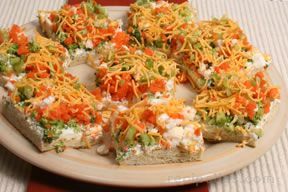 Spread chopped vegetables on top and top with shredded cheese. Note: crust may be baked the night before.